Katie went over the Town Hall structure. Members of Student Council introduce themselves. Riley Wheaton: Can you guys please review your plans for the election coordinator position? Sydney: Could you please define clarify? Riley: What are your plans? Sydney: We appointed a new election coordinator, Talia who is working with Mike Elias. She is very engaged with the position. We want to increase engagement such as by having people campaign. Andrew: There’s a new program called Campus Labs which Mike Elias is currently working on. Hopefully we’ll start using this program next semester to increase voter turnout. Maurice: One of the issue in elections is that people don’t know how many votes/percentage of votes is necessary to be elected. We hope to organize this information to better share it. Allison: I’m curious about the restructuring of Student Council. What do you think is not working? Sydney: One of the main challenges is that there isn’t a lot of carry over of people year to year. It’s hard to keep track of meeting structure, and there isn’t much institutional memory. It’s hard to build upon what has been done. We want more first year representatives so more first years are engaged in hope that at least one of those representatives will preserve and share the memory in their future years on Student Council. We would also like to have a Student Council Librarian. Michael Weber ‘19: I read about restructuring Plenary. What is the argument and counter-argument about the laptop ban which was mentioned on Havermemes. Jacob: One of the arguments in favor of banning laptops was to make sure that as many people are engaged as possible. It seems like there is only a small group of people who are engaged at Plenary. I personally think that the right decision is to nudge everyone towards paying attention to what’s going on at Plenary rather than on their homework. It’ll be a more valuable experience. I don’t speak for all members of Student Council, but I believe that Plenary is an important part of the education experience here, and therefore it should be treated the same way as classes are. Students wouldn’t do another class’ homework in a class, and that Plenary should be treated with that same respect. Andrew: A few years ago we had Plenary bingo which was fun but showed that not a lot of people participated. As a campus of more than a thousand students we should have more than 7-8 people speak at Plenary every time. Mariana: We recognize that we can’t fully enforce the laptop ban, but there is power in having a statement about discouraging laptop use. Maurice: Part of the difficulty in engaging with Plenary is that it doesn’t always flow. If we can really focus for an hour then we can hopefully have a more productive Plenary. Emily Lin ‘20: For accessibility and the resolutions, I find it to be very helpful to have PDFs of the resolution on my laptop. I’m wondering how this can be done in conjunction with a laptop ban. Evan Moon ‘21: We all agree what an ideal Plenary looks like, such as where there’s a lot of people gathering and paying attention. I was wondering whether the laptop ban and tshirts will get to the core of the problem concerning lack of student engagement, or if these [the laptop ban and tshirts] are only surface level fixes. Daniel Feshbach ‘20: I’m curious to hear more about the Campus Center Game Room which I heard will be a sort-of pub. I wonder whether students under the age of 21 can be in that physical space. Theodora Rodine‘18: I’m concerned that we don’t really have any more school sponsored dances or events anymore. Parties in basements or common rooms aren’t bad but can create tension. Anna ‘22: I know that on my hall people would’ve said a lot at Plenary if they didn’t have to stand up at the front and voice their opinion. Lev Greenstein ‘20: I know there was a form that Student Council was sending out with their Weekly Consensus. I was wondering whether there were any responses and if there were any specific problems and if these problems were discussed in meetings. Mariana: Katie and I created the Ford Form to receive feedback in an effort to increase communication between council and the student body. We’ve had this form for 2 weeks. We received 8 responses the first week about the Skate House but only one this past week. We are not sure whether the low response is because students don’t know about it, whether they are confused, or if they don’t care. Maurice: One of the comments was about our hard work, so that was cool. Going back to the accessibility concerns, I don’t know if this came up in the minutes, but we were talking about the floating mic idea. The floating mic idea means that people don’t have to come up to the front to speak. We will have the accessibility room in the GIAC again. We are working on a Plenary live stream so students can still be involved, although they won’t be counted towards quorum. Andrew: About accessibility and the screen, something we’re thinking about is having resolution writers submit a video along with their resolution so there can be an audible aspect. We’ve considered things as basic as seating, such as possibly not having all the Student Council members sit up at the front. We recognize that Plenary has been done the same way for a long time, and that we have the power to change it. Jacob: Going back to the issue of laptops, we want to encourage people to participate by speaking, but I really want to emphasize that actively listening is also a form of participation, and that’s the area where we, in my view, are really trying to emphasize. Katie: Does anyone want to speak about the pub idea? Andrew: These are all really important questions. The pub is currently still just an idea, and its financial backing needs to be further considered. It would be open to everyone in the community. The Game Room would hopefully be renovated. We hope to have professional bartenders that would serve beer and wine. Maurice: To the athlete question and how we address the crux of the problem [referring back to Evan’s comments] and referring back to Theodora’s statement, how do we reimagine the ways we come back as a community with specific traditions such as 80s dance? SLAC is currently working on this. Andrew and I originally imagined the pub space as a possible live stream for sports events. We can connect with Bryn Mawr and the tri-co with not just dances, but with comedy and other events. We have a lot of thinking to do about how we treat these spaces before we can move forward as a council. It boils down to us being a very small community with very diverse people coming to Haverford with very different reasons. My personal thought is that it’s our responsibility for us to create space and find points of commonality to feel less jaded towards our community. Andrew: SECs, the committee which planned these parties, is now defunct so SLAC took over the responsibilities. If you or anyone have any thoughts about possible events on campus, please let us know. Andrew: We’ve talked to Mike Elias about multiple ideas such as an anonymous comment system that could be broadcasted. We’ve been struggling with the identity aspect that impacts people’s decisions to speak up at Plenary. Julia: At our Plenaries last year, our anonymous comment function was utilized. We set up stations around the room where people could drop off their comments, and Student Council members read the comments. Devi: I want to thank everyone for being here today. A question for all of you: We’ve been trying to make more inclusive places on campus. Are there any spaces you feel uncomfortable in, and how can we as Student Council fix that? Also, is there any aspect of Haverford in which you feel extremely unsupportive in? Katie: If someone doesn’t want to voice their opinion, I can open up the anonymous form right now. Ian: As someone who hasn’t had much background in identity politics coming into Haverford and started out with the summer social justice institute, a lot of things covered were new to me. We have some spaces to talk about identity politics such as in customs groups, but I personally have found them to be unproductive since people are hesitant to fully speak their minds since they want to be nice to those they live with. I don’t have any ideas about how to address that, but it’d be great to open more spaces like that. Tara Colson Leaning ‘21: I was thinking about apathy in the student body. I feel like I know about Student Council stuff because I’m close with people on Student Council and that you guys are great at being approachable, but honestly I think it would be more impactful if Student Council went to the student body. If customs teams could be more involved in Student Council, we could have more of a network. Alison Rosenman ‘20: I think going back to feeling safe in spaces, I wish there was more clarity in the budgeting process, especially with the OMA and clubs that I’m involved with, such as Women in STEM and Women in Econ. Evan Moon ‘21: I work in the OMA as an intern, and to explain, the OMA hasn’t had great outreach and hasn’t been helpful in funding. A lot of our workers are unpaid. For student leaders, how can we make ourselves as leaders more approachable to the people and not the other way around? Andrew Eaddy: A lot of the stuff Maurice and I have been doing is to have productive discourse. A lot of the discourse on campus is unproductive, for example, the content on Havermemes. We want to open more spaces for discussion. Discourse on Discourse is this month, and various clubs on campus are holding events to talk about stuff that customs teams may not necessarily go over. Maurice: We mandated that Student Council members attend affinity club meetings. There’s a group of us every week that engage with community members. We want to ask, where are the people? Are they on social media? Is that where discourse is occuring? Is that indicative of what the discourse is? At affinity group meetings there aren’t always a lot of people there. Andrew and I have office hours, but it’s also a two way street. I commend all of you who are here for engaging with us. Where do you feel like you and your peers are having these discussions? 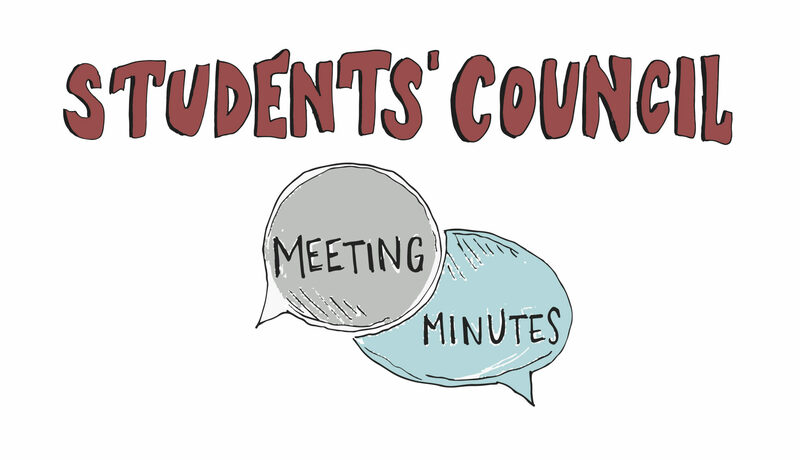 Do you and your friends know where and when Student Council meet? Alejandro: The way we define affinity clubs is that it involves a part of the identity that you don’t have control over. For example, people don’t have control over being women, but being a STEM or Econ major isn’t technically an affinity. We fund food for clubs such as ALAS and BSL because food is integral to that affinity club’s operations meanwhile we don’t fund food for other clubs because food is not a necessity to that club. Lev Greenstein: I think there’s a lack of coordination between smaller parts of Haverford such as groups that hold conversations and the rest of campus. I wanted to add to the questions that Devi brought up: if Haverford is apathetic and the ideal Haverford is where students are engaged, what does that look like and what do we gain, not that we don’t gain anything, but just wondering. Emily ‘20: I think this is more relevant to the Office of Athletics – people are uncomfortable with going into the GIAC. At times there can be a lot of athletic teams in the weight room, which can be intimidating. It can also be hard to access equipment since there are so many people. It would also be helpful to post lift times. Claire: There are lift times posted in the GIAC, but I recognize that this information isn’t shared as well as how it could be. I’m currently working with Nat, Cory, and Wendy Smith to figure out how to improve the GIAC’s accessibility. There’s an instagram account @haverhealth that posts the open lift times on all of its friday posts. One of the areas I personally feel unsupported in is lack of institutional support. Although it is great that students lead most of the things on campus it is exhausting to have to be involved in fixing any thing that is not working. It feels like we are not allowed to be angry because we are supposed to fix things even though we usually have a lot of other responsibilities too. I feel uncomfortable in the GIAC because intro to fitness, and other PE requirements, make fitness all about numbers and measuring progress. There are forms of exercise I really enjoy (in my case, that happens to be pursuit-evasion games like capture the flag, laser tag, etc – only if they’re not associated with any professional/league-organize sports culture) but I enjoy them because they have their own internalized goals and I don’t have to think about them as exercises. Jessie: I feel like there is a lack of outdoor study spaces. We could have picnic tables over the ground. It’s very uplifting to be outside, especially on such a beautiful day like today. Andrew: We are working with the athletic department to figure out how we can make the GIAC and its programs more accessible. For example, having mirrors in the Multi-Purpose Rooms can be unsettling. Karan ‘22: I was at the labor union meetings, and there was concern about payment for customs members. I think a lot of campus would agree with paying customs members, but I don’t know how we would fund that. Is there a way to see how the school budgets itself, so we can see if we can reallocate funding towards paying customs members. Joe ‘20: I think that Student Council is working to make more accessible spaces and this is very important for Plenary, but the problem with student apathy is that part of the problem is that students have responsibility too. It takes courage to speak up in front of a lot of people. I certainly get nervous in speaking up at Plenary, and even now, but there’s a need for courage. Maurice: To end, I want all of the speakers to address Lev’s comment about what engagement looks like. Sydney: To address some of the issue with student wages on campus, these are very complex issues that involve institutional funds. Shayan, the other Co-Vice President, and I along with Mike Elias and Michelle have created a task force for student employment on campus, which will address wages and the role of service vs. work. We are collecting data, which will be insightful to see what type of labor is required in each job. For example, the job of a DC worker is very different from a desk worker’s job. We then want to examine wages on campus and see where institutional funds can be reallocated. We also want to look at Bryn Mawr’s structures and see where we can draw inspiration from the way they’ve done things. I think the student labor union is a very good step, and hopefully it can work in conjunction with this task force. Andrew: Paying customs members would be extremely expensive and would change the role of customs members. Maurice: We are considering other forms of payments such as credits for books and housing to see if we can get folks who wouldn’t normally participate in Customs to get involved in Customs. Jacob: Going back to Joe’s comment, it does take courage, which is why some people opt to use social media instead. Courage aside, there are a lot of barriers of entries to discourse that we as Student Council should work towards removing. In the long term cultural change can require rules or mechanisms to push everyone into the right direction so the change can last. We want to think about our long term impact on the incoming classes. Andrew: To the outdoor space question, the oval outside of the DC was meant to be an outdoor working space, but we recognize that’s not satisfactory. Maurice and I have been thinking about new study spaces on campus and how we can improve these spaces. For discourse on campus, it seems that a lot of the discourse on campus is repeating and isn’t going anywhere. Maurice: My vision for campus engagement is one where people don’t feel powerless in voicing their opinions. Most of you don’t know the upperclassmen who’ve influenced me. I want you to know that the administration is working on our behalf. It will be uncomfortable to lean in, but you are empowered. As Jacob mentioned, how can we make a community where people are heard? Some of that deals with involving more underclass students. Hopefully it’ll get to a point where we don’t have to run four elections for one seat and create a flow to Plenary. Mariana: To address concern about lack of institutional support, I’m on the Task Force for Classroom Climate and there are offices such as the Provost Office that know that they’re failing students of marginalized identities, including first-gen students, students of color, etc., Haverford prides itself on admitting more marginalized students but that doesn’t mean that the administration is doing enough to support and empower those students. I just wanted to acknowledge the comment regarding lack of institutional support and say that I hear you. Devi: I agree with Mariana’s comments. For student apathy, we have so many clubs and committees on campus for student engagement. I feel like the environment isn’t as collaborative as how it could be. When Brett and I wrote the resolution last year for mandating gender neutral bathrooms on campus, we were shut down by Special Plenary Committee because they didn’t want us to take their time. We felt very discouraged, but I encourage all of you who want to bring a resolution to stay strong. Julia and Saumya, last year’s co-presidents, helped us get bring our resolution to Special Plenary. The moral of the story is that if you really care about something you can make it happen. We are very divided as a community, and I understand that in a lot of cases that can be a form of support, but that also decreases the actual diversity of the school. I feel like if you look at the DC, there’s really no diversity when looking at who’s sitting with who. Katie: I just want to thank BLAST and the DC for helping us. In my opinion, this is what student engagement looks like so thank you all for coming. Please come up to talk to us if you have any ideas you want to share. *These minutes reflect summaries written by Claire Cai ‘21, Students’ Council Officer of Athletics. Questions/comments? Email hcsecreatries@gmail.com or submit to the Ford Form.